The last time you touched 5 kilogram dumbbells was probably while searching for shoes under your wife’s side of the bed. After all, light weights are for women and injury rehab, right? Serena says: “Wrong, dumbass!” Working both ends of the dumbbell rack hits a broader spectrum of muscle fibres and challenges your muscles in ways that using heavier weights alone can’t. “You’ll increase your strength, power, and mobility,” says MH fitness director BJ Gaddour. Weave these 10 exercises into your workouts to see for yourself. 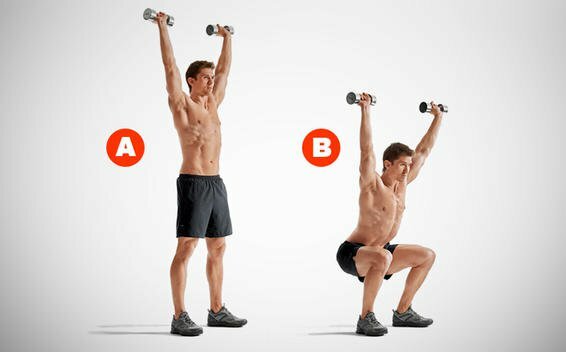 Stand with your feet shoulder-width apart and hold a pair of dumbbells above your shoulders, palms forward. Lower your body until your thighs are parallel to the floor. Drive through your heels to return to the starting position. Do 5 sets of 10 reps. 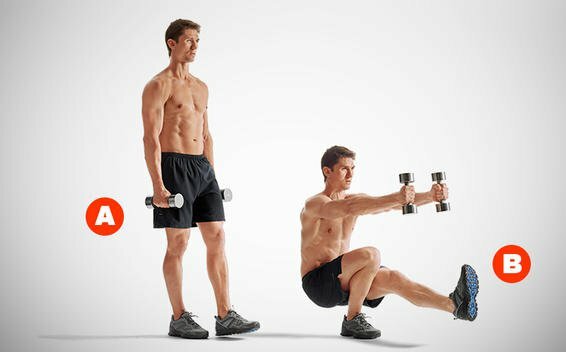 Assume a crab-walk position, holding a dumbbell in your left hand in front of your shoulder. 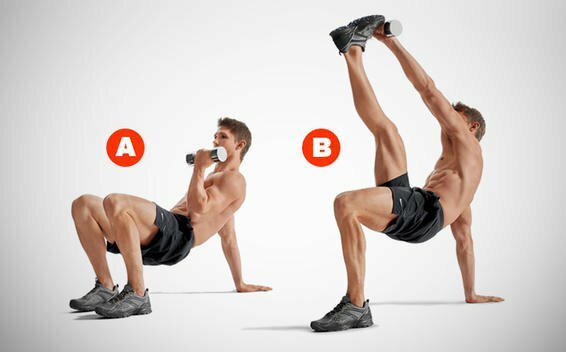 Raise your right leg and reach for your toes with the dumbbell. Return to the starting position. Do 10 reps, switch arms and legs, and repeat. That’s 1 set; do 3. 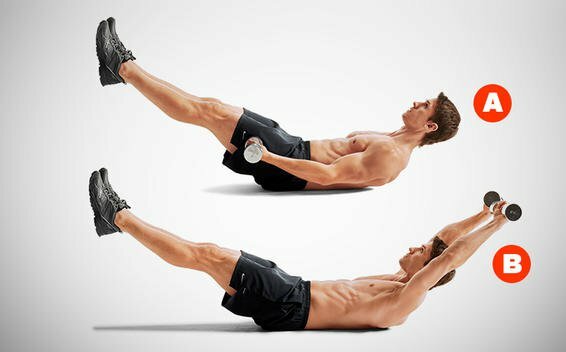 Lie on your back with your right leg bent and left arm by your side; hold a dumbbell in your right hand above your chest. Roll onto your left side and prop yourself on your left forearm. Straighten your left arm, raise your hips, and push into a half-kneeling position, threading your left leg behind your right. Stand up. Reverse the move to return to the starting position. Switch sides and repeat. Do 100 reps (50 per side) on days you don’t hit the gym. 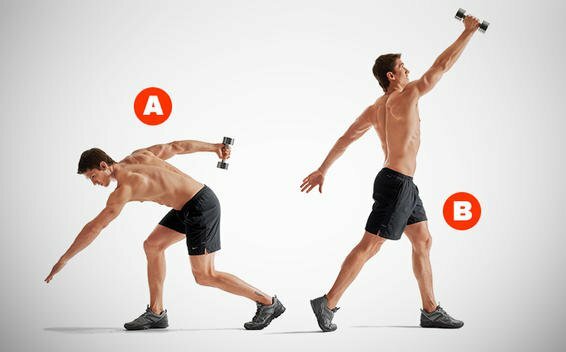 With a dumbbell in your right hand, stand with your feet slightly beyond shoulder width. Turn right by pivoting on your left foot; bend your knees and lower your body as you reach back with your right arm and down with your left. (Imagine you’re winding up to hurl a discus.) Pivot left, swinging your right arm up and left arm back. Repeat for 20 seconds; rest 10 seconds. Switch hands and repeat in the other direction. Continue 4 minutes. Stand tall with your feet slightly beyond shoulder-width apart. Hold a dumbbell in each hand in front of your ribs, palms facing each other. 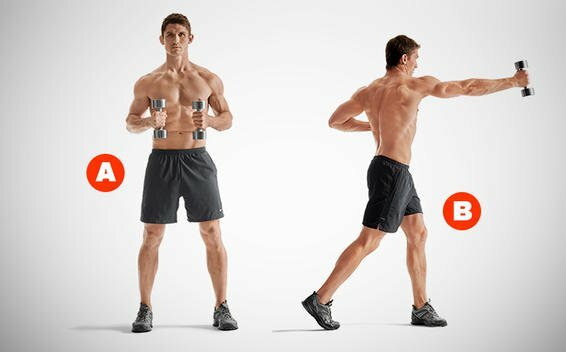 Twist your torso to the left by pivoting on your right foot, and punch straight out from your shoulder with the dumbbell in your right hand. Now pivot right, punching explosively with the dumbbell in your left hand. Continue alternating sides for 30 seconds; then rest for 30 seconds. Do this 5 times total. Stand holding a pair of dumbbells at arm’s length next to your sides. Take a step forward with your left foot, bend your knees, and hinge forward slightly. 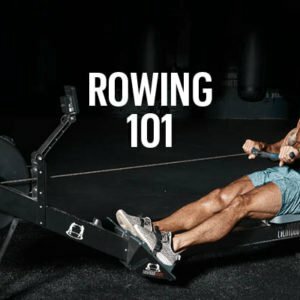 Row the dumbbell in your right hand to your right side, and then lower it as you row the weight in your left hand to your left side. Continue alternating sides as fast as you can for 20 seconds, and then rest for 10 seconds. Switch legs and repeat. Continue for 4 minutes. Grab a pair of dumbbells and assume a pushup position with your palms facing each other. Spread your feet slightly. Your body should form a straight line from your head to your ankles. Now lift the dumbbell in your right hand off the floor slightly, and curl it toward your right shoulder. (Try not to move your upper arm.) Lower it, and repeat with your left arm. Continue alternating right and left curls for 30 to 60 seconds. 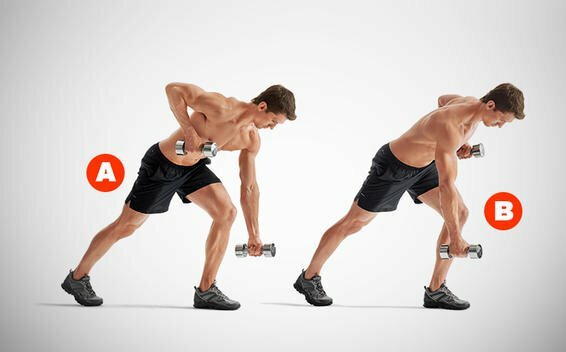 Hold a pair of dumbbells by your sides, palms in, and assume a staggered stance, left foot forward. Lower your body until your left thigh is parallel to the floor. 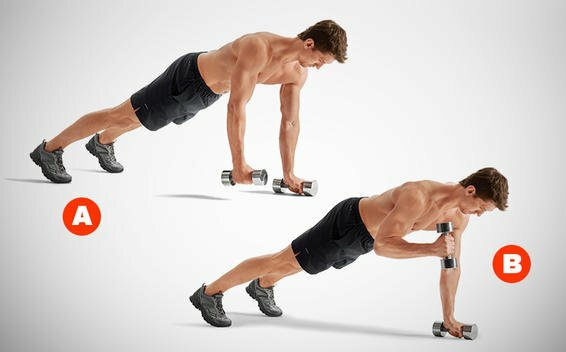 Pause, and push back up as you raise the dumbbells out to your sides. Lower them as you drop back into a split squat. Repeat for 5 minutes, resting as needed. Switch legs every 5 reps. 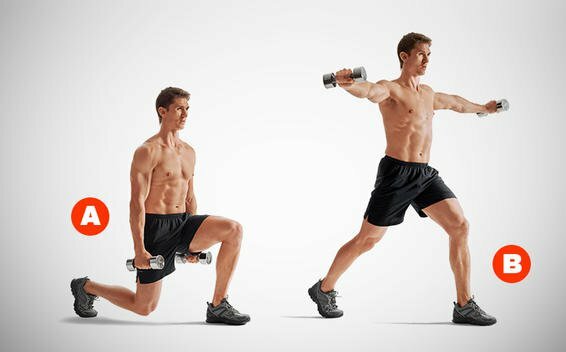 Hold a pair of dumbbells by your sides and raise your left foot off the floor. Keeping your leg raised, lower your body into a squat, lifting the dumbbells in front of you. Return to the starting position. If that’s too hard, squat onto a bench. Do 3 sets of 10 reps. 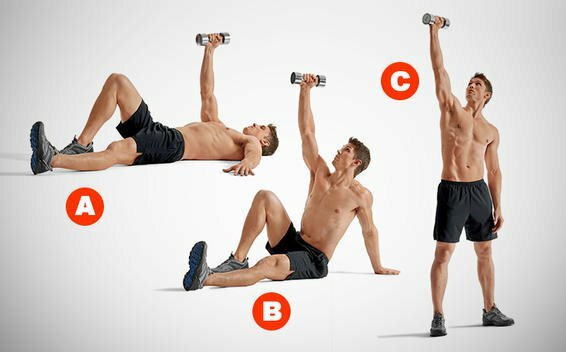 Lie on your back with your feet together and a dumbbell in each hand next to your thighs, palms up. Raise your legs and upper body off the floor. Sweep your arms above your head in an arc, and then back to your sides. That’s 1 rep; do 3 sets of 10 to 20 reps. 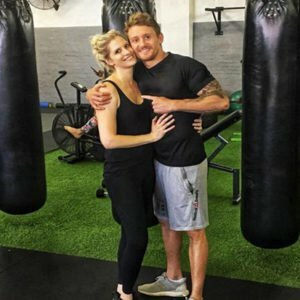 This Full-Body Workout Is Perfect For Building Lean Muscle & Will Improve Your Relationship Too!